Call Brandon Bailey, PLS to discuss any construction surveying or construction staking needs you have in the Mobile, Alabama area. Before a construction surveyor starts any activity, thorough planning is carried out. Throughout the construction process a surveyor assists the work as necessary. The construction survey contributes an important piece to the whole construction project. The construction survey keeps watch on reference points and establishes markers which steer the construction of any site improvements. So, What is a Construction Survey? A Construction Survey is basically a survey that sets out locations and/or grades for building construction activities; the process of evaluation and estimation prior to or during construction activities; and the as-built survey at the end of construction. 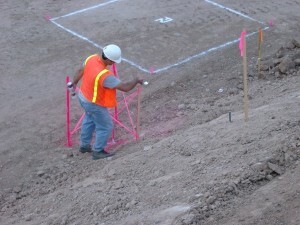 The construction survey is sometimes called construction staking because stakes are normally set to guide the work. Measurements are done for reference points which determine the location of the planned structure or improvements, vertical and horizontal positioning, dimensions, configuration, and to control the elevation of the new structures. The purpose of doing a construction survey is to maintain and establish the necessary vertical and horizontal control needed for a construction project. It includes taking measurements which are mandatory to determine quantities, and then document this to corroborate the final payments made to the contractor. Post construction, the “as-built survey” is used to assess the final position and adequacy of the work, and to compute construction payments and be able to establish “as built” conditions. The “As Built” construction survey is conducted as the construction works are finished to verify the accomplishments as specified on the designs and plans. Reconnaissance, and Control of the project area respectively are the tasks in this phase of the construction activity. The preliminary survey for the site collected the existing conditions. The construction surveyor should make sure these conditions are still the same before construction is begun. 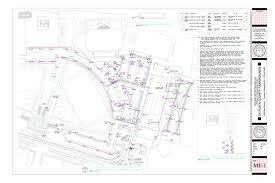 The site must match the plans existing conditions sheet in order to place the new improvements on the site correctly. Without this the final quantities will be off, and improvements may be out of place. This construction survey field work includes recovery of existing vertical and horizontal control, augmentation and replacement of control stations that are necessary to control the construction project, performing checks of the vertical and horizontal control network, comparison of resultant coordinates to the original, collection of confidence points to check and validate the terrain model, condition documentation, and performing utility relocation surveys as necessary. Gathering of the Design Data which include Project plans in digital and hard copies, Control Data (Vertical and Horizontal), Alignments (Vertical and Horizontal), New site DTM, R/W data (with maps, descriptions and obligations), and Specifications. Finally, here is an illustrated example of how a plan sheet for a Construction Survey might look. The will guide the construction staking process. This is presented as a topographic survey map which includes all of the vital features illustrated with contour and/or spot elevations that represents the elevations. The main purpose of a construction surveyor involves getting accurate and efficient measurements to ensure that constructed objects are in the correct location on the site. In order to ensure that you are relying on the right person, it is not enough to merely check his license (and you should always insist on a licensed surveyor) but, you must verify that the surveyor has experience on construction sites and that he/she can think on their feet. Situations change very quickly on a construction site and your surveyor should be able to adapt. Construction surveyors advise contractors, engineers and other professionals while the process of construction is ongoing. While communication is important in most jobs, it is especially so on a construction site. The construction surveyor must have a wide range of knowledge in what the other professionals on the site are doing. This understanding of the job and what is required of the other professionals helps the surveyor to anticipate the needs of the other members of the development team. Sometimes there are also competing interests on a site. For example, the curbing contractor might be different than the paving contractor. Differing grades on the curbing can cost the paving contractor a significant amount of money. This situation can lead to a lot of finger pointing. A diplomatic surveyor can smooth out some of these conflicts. Even the slightest errors in major construction projects are magnified by the time the project is completed. This usually translates to significant sums of money. This is the reason why the surveyor must ensure great precision in calculating points and in providing instructions. For instance, if an existing building is being expanded, it is extremely important to check the exact location of the building before the addition is begun. This is one of the most common errors in a building addition project. A construction surveyor’s task involves a lot of demands. These demands include initially collecting information regarding the existing site, comparing these existing site conditions to the plans and previous surveys, and preparing to and staking out multiple site improvements. These site improvements may be for multiple contractors, who all make the requests at the same time. Again, it is common for mistakes to happen at this time because of the surveyor possibly rushing the work to satisfy everyone. And, as stated above, site conditions change suddenly which requires sudden alterations in the project and in coming up with an immediate response or an appropriate remedy. Upon the completion of the project, the surveyor checks whether or not the resulting work has been built according to the plans. For your Construction Surveying needs, call Brandon Bailey, PLS at (251) 281 2081 or fill out our contact request form.